You may not know it, but many restaurants and grocery stores in the Columbia Valley carry Konig Meat and Sausage Co. products on their menu or sell them in their meat isles. Invermere has had a butcher shop since 1917, providing the townspeople with butchering services for local livestock that kept the local population thriving from the early 1900’s throughout future generations. Today The Konig meat and Sausage Company carries on that tradition by offering cut and wrap services for local farmers and small livestock producers. 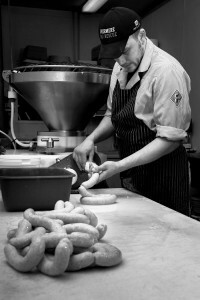 Aside from the professional Cut and Wrap, our ability to custom craft a wide assortment of different sausage in a spectrum of flavours and textures in Fresh, Cooked and Dried Forms is what keeps our customers coming back. As well as offering services for Domestic Animals, a large portion of our business from September to December is the processing of wild game for local sportsmen and hunters. We offer the traditional cut and wrap as well as sausage production services that our sure to turn your fall harvest into a gourmet level product. We would like to add that the owners have young families and donate time to the Invermere FD as Well as local organizations like the Windermere Rod and Gun Club. Active in charitable donations for local projects and events. We have daily lunch specials, come by to enjoy one of our a freshly made selections. 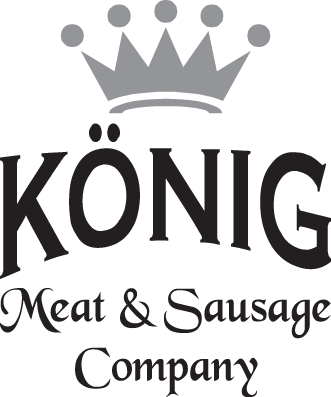 Konig Meat and Sausage Co. is renowned for our authentic gourmet, hand-made sausages. Try our traditional German or modern varieties. Come by Konig Meat and Sausage Co. for our daily lunch specials, a fully stocked deli with smoked meats and cheeses, as well as select salad options. We believe in tradition and quality at Konig. Trust us when it comes to select cuts of beef, pork, lamb or chicken - perfect for an unforgettable dinner. The BC Rocky Mountains are home to some fantastic wildlife. Avid hunters will appreciate our full service game processing, and affordable rates. Copyright 2019 © Konig Meat and Sausage Co. All rights reserved. 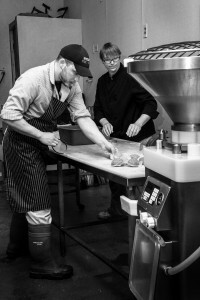 Konig Meat & Sausage Company is a locally owned deli and butcher located in Invermere, BC. We use traditional old world European techniques to produce some of the highest quality, award winning sausage in the area. Konig Meat & Sausage Company is not just a place for good quality food but a lunchtime gathering place to meet and discuss current events or new ideas fuelled by great tasting and hearty selections from our in store menu.